Served 6-8 as a light snack, 4-6 as a side dish. A great excuse to buy local market produce and break out the grill! 3-4 lbs of Eggplant – globe, Japanese, Thai – get what looks good! Get your grill started – you want the coals ashed over a bit before you begin. 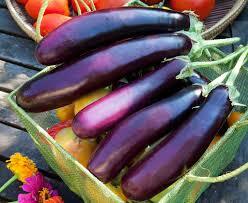 Cut eggplants lengthwise, soak in lightly salted water for 30 minutes. Drain and pat dry, brush cut sides with oil, salt lightly. Grill cut sides down until quite black and deflated looking. Remove eggplants to a large heatproof bowl and cover w plastic wrap. Remove wrap and cool to warm room temperature. Gently scoop out soft insides, discard skins. Gently mash with hands or potato masher. Taste for seasoning – if serving right away, a squeeze of fresh lemon juice and a sprinkle of roasted chiles and/or cumin is delightful. If refrigerating for later use, avoid adding anything acidic until ready to eat. This is delicious on toast, with roasted chicken, or as a dip for vegetables, crackers, grilled bread.